One of the most distinguished and versatile scholars who emerged in the last century in Sri Lanka was Professor Ediriweera Sarachchandra. He had rendered an outstanding service to enrich the fields of Sinhala drama and Sinhala literature. This luminous star was born at a remote village named Gammeddegoda in Ratgama on 03.06.1914. Sarachchandra’s father was a postmaster. The parents kept his name, as Reginold Silva. Later, Sarachchandra changed his name by him self, as Ediriweera Sarachchandra. His inborn talent and dedication contributed him to be a distinctive writer and a playwright within a short period of time. In 1933, Sarachchandra was fortunate enough to enter the Colombo University College. Young Sarachchandra won the degree in 1936 with a second lower division. His first degree from University College was in Pali, Sanskrit and other subjects. Having obtained the degree, young Sarachchandra appeared for Ceylon Civil Service competitive examination. Although he gained the highest marks at the examination, Sarachchandra was unlucky at the interview. This young graduate was not selected to enter the Ceylon Civil Service. He wrote for civil service competitive examination for the second time. Even in this attempt, Sarachchandra got through the written examination. However, he was suffering from chicken pox, when the interview was held. Sarachchandra was not sad due to this unlucky situation and changed his route. In my view, this was a disguised benediction happened to young Sarachchandra. If he had been selected to the Civil Service, he might have not rendered a valuable service to develop Sinhala literature and Sinhala drama. In 1939, young Sarachchandra entered the musical college, Shanti Niketana in India, and studied music and philosophy happily. After following his course, Sarachchandra arrived in Sri Lanka. In 1944, this scholar was recruited to the university of Colombo as a Pali Lecturer. In the year 1949, Sarachchandra entered the London University for higher education. Doctor Sarachchandra was conferred postgraduate degrees both M A and PhD from that university and returned to Sri Lanka. Later Doctor Sarachchandra was appointed, as a Pali and Sanskrit Lecturer to Peradeniya University. In a short period of time, he became popular among lecturers and university students due to his humanity and capability. Doctor Sarachchandra was deeply committed to the fields of Sinhala drama and literature. After identification of Sarachchandra’s talents and dedication for enriching Sinhala drama and Sinhala literature, he was awarded a Professorship in Sinhala Department of Peradeniya University. Professor Sarachchandra has evinced talents in many fields. He was an intuitive short story writer; a novelist; a playwright; a drama lyricist; a literary critic, a translator, a huge writer who had done many researches and written scholastic books. This creator wrote several collections of short stories. Some of them were Maayaa Roopaya, Roopa Sundari, Gruhaniya and Kaalayaage Ewamen. 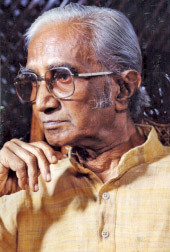 In addition to his outstanding success as a short-story writer, Sarachchandra composed several novels named Malagiya Etto, Malaunge Avurudu daa, Walmatwee Hasarak Nodutimi, Lokuputha Nohoth Bandulage Paraawartanaya and Heta Echchara Kaluwara Nehe. Sarachchandra developed drama field also. He wrote stage dramas and radio dramas. Professor staged stylished dramas such as Maname, Sinhabaahu, Wellawehum and Mahaasaara. Some lyurics which were written to dramas are sweet and excellent. The songs “Gal Lena Bindala” and “Premayen Mana Ranjitawe” are melodious. These songs were composed to Sinhabaahu and Maname respectively. This erudite pandit published many literary and scholastic books. A few of them were Saahittiya Vidyaawa, Sinhala Nawakatha Ithihaasaya Haa Vichaaraya, Kalpanaa Lokaya 1 and 2, Sinhala Gemi Naatakaya and Darmista Samaajaya. Our great writer laid the foundation to build a system of local literary criticism. He was influenced by the oriental criticisms as well as occidental criticisms. However, he gave more trends to occidental criticism systems. As a result of this, novelists such as Piyadasa Sirisena and W A Silva were underestimated to some extent by Sarachchandra. In 1983, this scholar was conferred Kumaaran Ashaan Universe award from India. In addition, Megsaase award from Philippines was conferred to Sarachchandra. However, some Sri Lankans did not respect him. In 1982, when he was making a presentation regarding the “Decadence of Sinhala Culture,” Sarachchandra was attacked by thugs. This reputed scholar suddenly became ill and expired on 16, August 1996. When he was admitted to the hospital, Sarachchandra was ill-treated by some attendants. This shows the deterioration of Sinhala culture and society. The valuable books endowed by Professor Sarachchandra to the nation may be utilized in future. Even stage dramas produced by him will last for a long time. Therefore, the name “Ediriweera Sarachchandra” could not be obliterated form Sinhala drama and literature fields.